The journey to the priesthood for one seminarian began in Haiti and meandered throughout several countries. However, April 6 he was ordained a transitional deacon, one small step on his spiritual journey. 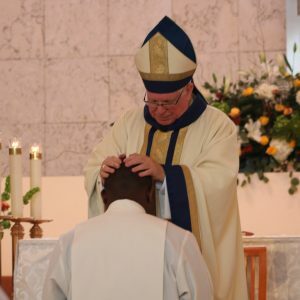 “This ordination for me is a moment of grace, a time of thanksgiving to God for his fidelity to me,” said Diocese of Venice Seminarian Franckel Fils-Aime, who was ordained by Bishop Frank J. Dewane at St. Joan of Arc Parish in Boca Raton. 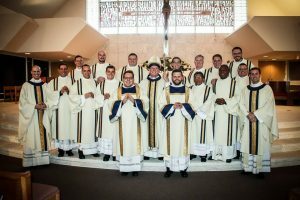 Bishop Dewane ordained a total of 15 seminarians of different seminarians from Florida arch/dioceses, most being from St. Vincent de Paul Regional Seminary in Boynton Beach. The Church was filled with family members, friends, guests, seminary faculty and leaders, priests and brother seminarians, all a witness of great support for the candidates soon to be ordained to the diaconate and to the Church. Deacon Fils Aime was joyful afterwards and reflected to the day so long ago when he told his parents about his vocation decision. Born in Cornillon (Potino), in west Haiti, Deacon Fils-Aime celebrated his 40th birthday one month ago. The son of Voguel Fils-Aime, residing in Haiti, and the late Philomène Remy, he is the oldest of nine. His father and two siblings were present for the ordination. Deacon Fils-Aime began formation at age 26 with the Order of Friars Minor. He lived in community with the Franciscan Capuchins and continued to study and discern in the Dominican Republic and Brazil. It was in 2014 when he heard God calling, loudly and clearly, to become a diocesan priest. He subsequently joined the Diocese of Venice in 2015. 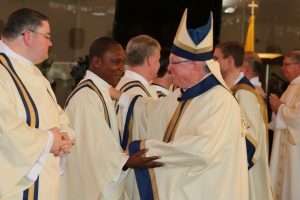 Now carrying the new title of Deacon, this last phase of his formation before being called to priesthood, Deacon Fils-Aime, can baptize, witness marriages, perform funerals and burial services, distribute the Eucharist and preach the homily.